Oh I’m so sorry. I’m sorry. I’m sorry. I’m sorry. I did it again. I up and left you all and went on hiatus for a month or so without telling you. I have done it a couple of times before and keep vowing to never do it again but it seems to happen. I don’t really have an excuse this time…just life….with two toddlers. I love love love my blog. I love creating recipes. I kind of love the photography (it’s a work in progress and the more I improve the more I love it). Most of all I love getting comments from people who have made my dishes and loved them. I really do love this blog but holy [email protected]&* I just have no time to do it. I know everyone says that if you make something a priority then you will always have the time for it. I also know that there were a lot of sacrifices that went into the success of all the big blogs I love but I really really struggle to find the time. 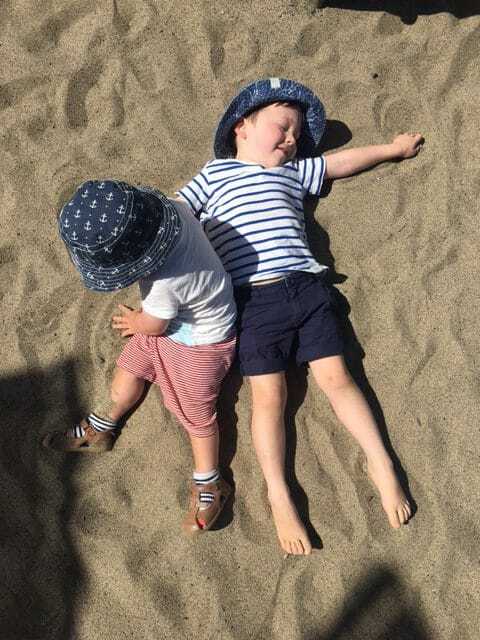 I have two little toddlers as you all know…. actually let me elaborate, I have two little toddler BOYS. I can sum up what it is like to live with two toddler boys in two words: my backyard. The state of my backyard sums it up completely. Right now we are approaching the end of summer so my boys have had free run of the backyard for a good four to five months now. We don’t have a dog, we have a cat, which I’m pretty sure is not responsible for this, but the state of my backyard right now looks like two big labradors have gone to town digging, hiding bones, peeing on trees and chewing on toys and outdoor furniture… and the mud, oh the mud! So I’m pretty sure it’s not the cat or two mysterious labradors, I’m pretty sure it is my two angelic little toddler boys. They are busy all the time, whether it is destroying the backyard, getting every single toy out in the house, sprinkling glitter all over the dining table or running around the house waving their arms like bushwackers. So I spend all day trying to keep up with the craziness and then once they are in bed at night only then do I actually have a precious two hours to myself (well, actually a lot less once I clean up, do the dishes etc.). I usually debate whether or not I should slump on the sofa eating chocolate and/or ice cream and watching TV or doing my blog….hmmmmm….usually the sofa wins out….it’s a really comfy sofa so the odds are unfairly stacked in the sofa’s favour. 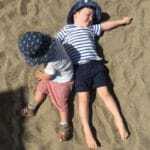 To tell you the truth, I really do need that time just to relax and chill and I am a better mum for it when I’ve had a little time to myself, so as much as I would like to work to midnight every night on my blog it is much better for the boys and me if I can recharge ready for the next day. Good news though, little Harry will be two soon (shucks, my little guy is growing up) so he’ll be going off to preschool two days a week soon and I’ll have two full days a week to do some blogging, I know, such a luxury and I totally appreciate it and look forward to it. 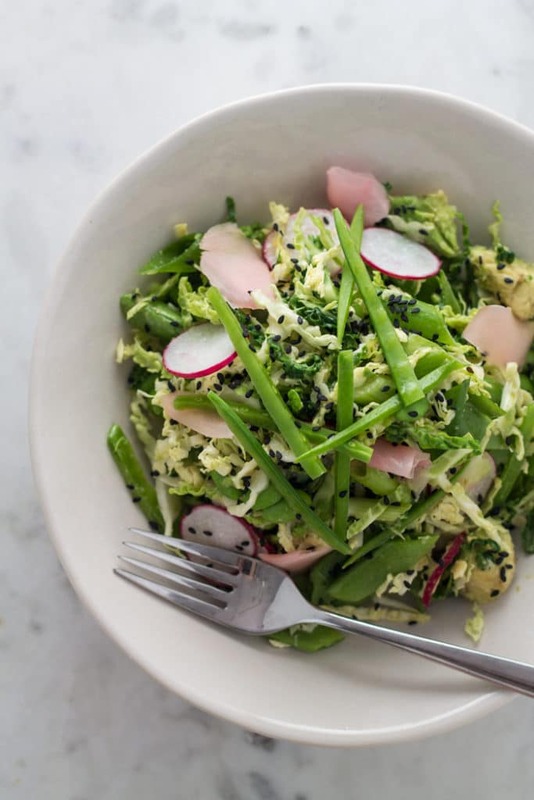 In the meantime, I’ve managed to find a little time to make this delicious late summer salad, my Edamame and Miso Salad. 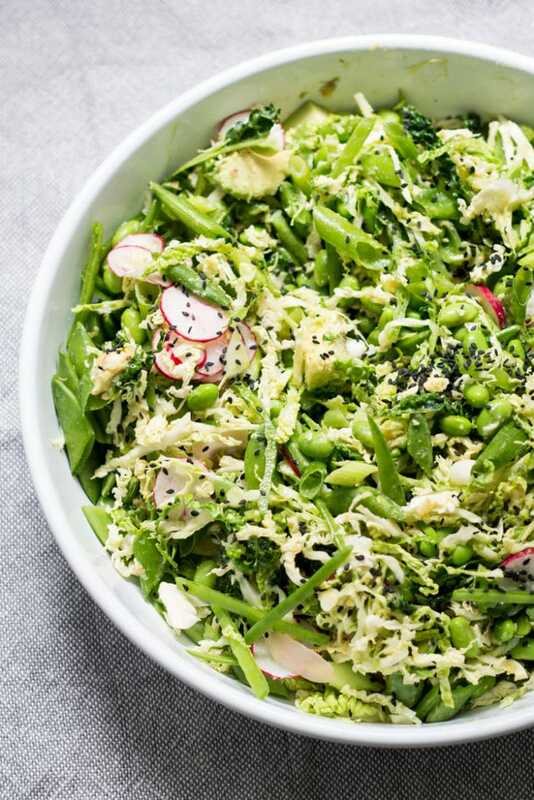 I debated whether to call it Edamame and Miso Salad or my Detox Salad because it is full of wonderful fresh green vegetables and miso which are all so good for you, but as you know, I can’t handle a detox so Edamame and Miso Salad it is! 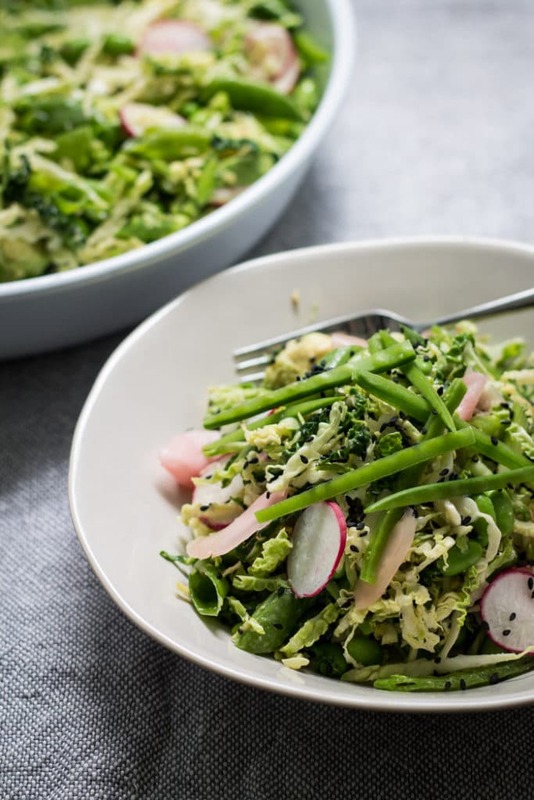 This salad is all about the greens so it’s packed full of them but greens can be a little (yawn) boring on their on so I’ve amped up the flavour with a Japanese inspired miso dressing, a little hit from some pretty pink pickled ginger and some all important creaminess from some avocado. The salad is super forgiving to mixing it up so feel free to ad lib a little with what you have on hand. No cabbage? Throw in some sliced crunchy cos lettuce. 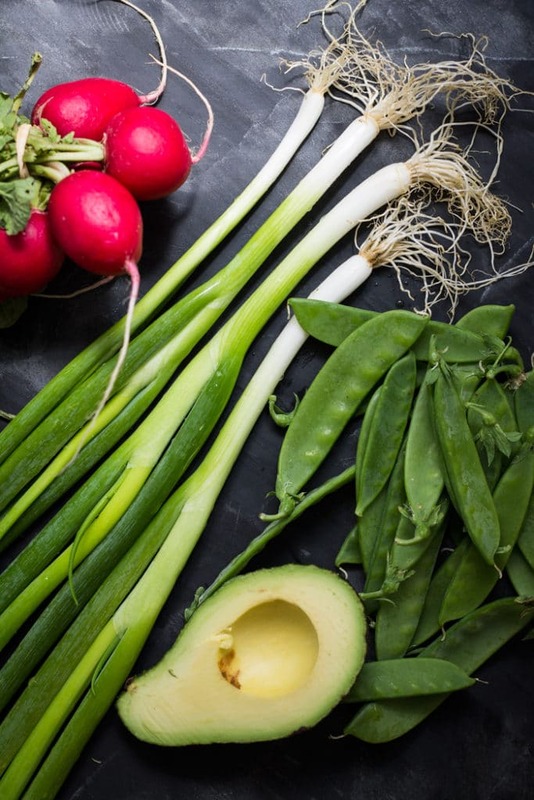 No snap peas? Double the snow peas. No pickled ginger? No problem just leave it out, it still tastes great! No mirin? Go buy some so you can make my Sticky Soy Glazed Chicken Wings. No, I joke, just substitute with 3 Tbsp white wine, dry vermouth or dry sherry and 1 Tbsp caster sugar. 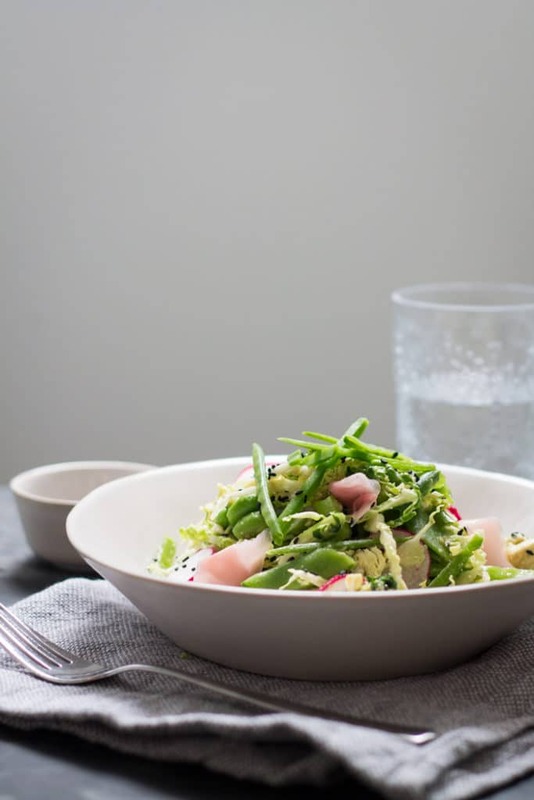 This is a great fresh green salad for the end of summer and great served along side some simple grilled fish or chicken. Apart from the chopping it is also relatively quick to put together so if you’re like me and unfortunately don’t have much time to spend in the kitchen because you are chasing two labradors around the house then this is definitely one for you! Bring a large pot of salted water to the boil. Add frozen edamame beans and bring back to the boil. Boil for 2 minutes then drain and transfer to a bowl of ice cold water to stop the cooking process. Leave in the ice water until they are cool then drain and add to your salad bowl. 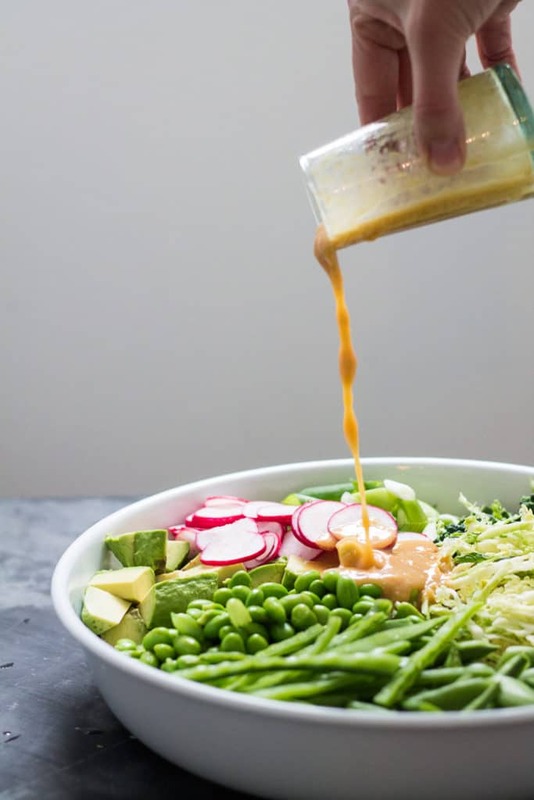 To make the dressing add all the dressing ingredients to a small bowl and whisk together until combined. 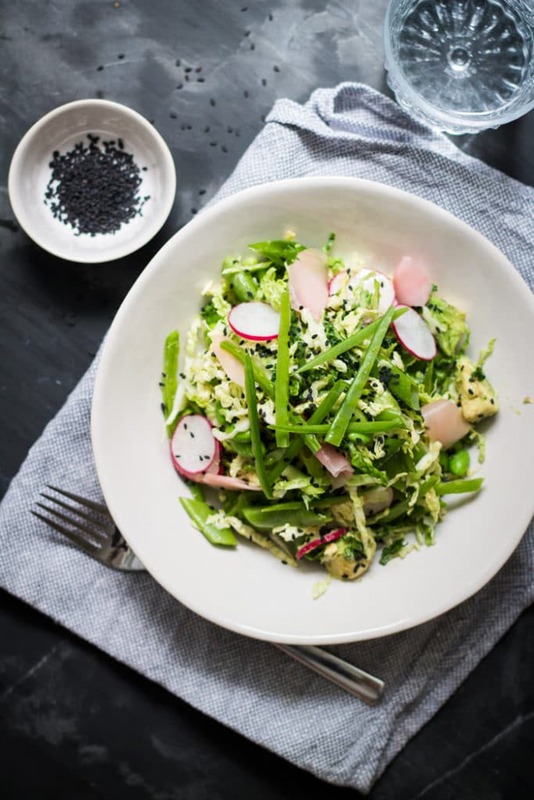 Place the edamame, snow peas, spring onions, cabbage, avocado, radishes and half the sesame seeds in a large serving bowl. Pour over the dressing and gently toss together. Sprinkle over the remaining black sesame seeds, scatter over the pickled ginger and serve. Mirin is a Japanese sugary rice wine similar to sake. I used the shio mirin which has less than 1.5% alcohol and is burned off during cooking. You can easily find this at your local supermarket in the international foods section. If you can’t find mirin then substitute with ¼ cup white wine, dry vermouth or dry sherry and 1 Tbsp caster sugar. Sounds really fresh and tasty! Love the photos! Thanks so much Josephine for your kind comment. My photos are definitely a ‘work in progress’ so your comment is a big deal for me…made my day! Thanks! Aww you should never say sorry for having too much fun! We all need it 🙂 That salad btw, sounds so refreshing and I am currently obsessed with miso! You can definitely be my friend, anyone who loves miso is definitely a good friend of mine! Thanks so much Kankana! Kate, this salad looks delish and I love your two little labs. How precious. Thanks for sharing. Beautiful blog. Thanks so much for your lovely comment Dina. The labs are pretty cute…most of the time.